With their season swirling down the drain, Canadiens coach Michel Therrien touched the third rail on Wednesday night when he benched and called out the team’s leading scorer in P.K. Subban. Therrien did not mention Subban by name, of course, but there was no confusing his reference after Montreal’s 3-2 loss in Denver. “An individual play cost us the game tonight,” Therrien told reporters in French. Therrien was referring to Colorado’s go-ahead goal with 2:03 to play, a sequence that began with a Subban turnover near the Avalanche blueline. It ended with Jarome Iginla tapping in his 97th career game-winner after a defensive breakdown at the other end of the ice. Therrien sent a strong, if damning, message to the rest of the Canadiens. 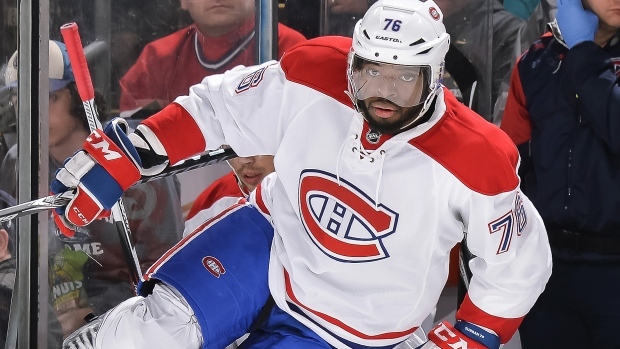 Down by a goal, desperate for points, Subban was bolted to the bench for the final two minutes of regulation. Nathan Beaulieu and Andrei Markov played most of the remainder of the game while Subban looked on. In using Subban as the scapegoat, Therrien declined to acknowledge the gaffe that left Iginla all alone in front of the net. Canadiens fans have been up in arms with Subban’s play of late. Naysayers pointed out that Subban leads the entire league in giveaways (85), with nearly 12 more than the next player on the list, who happens to be Norris Trophy candidate Drew Doughty. But Subban also leads the Canadiens in assists (39), points (44), shots on goal (150) and ice time (25:39). He had 20 points in the 21 games prior to Wednesday night. His turnover numbers, a subjective stat since they are tracked differently in each arena, are more likely a result of the amount of ice time he logs. If anything, the advanced metrics indicate the puck is safer on Subban’s stick than any other Canadiens’ defenceman, according to RDS contributor Andrew Berkshire. With the loss, the Canadiens remain six points back of a playoff spot, and the four teams they’re chasing all have at least one game in-hand. The Habs are 10-23-2 since Carey Price went down with a lower-body injury on Nov. 25. Therrien has been roundly criticized this season with the wheels falling off the Habs. His line juggling and lack of in-game adjustments have come under fire. What cannot be questioned is that Therrien failed to arm the Canadiens with the best chance to tie the game on Thursday with Subban glued to the bench. It was a bold move that could well bring a simmering situation to boil in Montreal’s dressing room. Just don’t expect a coaching change. GM Marc Bergevin said firmly on Jan. 21 that Therrien would remain the Canadiens’ coach for at least the remainder of the season.